After many requests, and a bit of help from inxile (who are working on Wastelands2 and need a GNU/Linux exporter from Unity as part of their commitment at Kickstarter). The upcoming popular game engine Unity4 will have a native exporter to GNU/Linux desktop (before you could only play Unity games via the Chrome browser) ! So many more games can be ported to GNU/Linux. The Linux player is an excellent example of a grassroots movement in Unity. Over two years ago, developers started using their Fridays and free time to port the engine to Linux. The port made slow progress, but was kept alive and maintained over the years. At the 2012 Ninja Camp development week, these developers spent the week furthering the porting effort, and at the end of the week, they were able to show some compelling demos. Combine this with the recent success of commercial games on Linux — for example the Humble Indie Bundle and games sold through the Ubuntu Software Center — and it was clear we needed to give our customers a chance to enter into this still-largely-untapped market that is hungry for games. Why is it still a preview? Supporting a new platform is no easy task –especially one that has a wide range of variations in hardware and software. It will take more testing and feedback before we will feel confident the quality is up to such a standard that we can ship a final version. However, this should not stop you from using it. Many games will run without Linux-specific problems on most modern Linux systems, and problems you encounter can be reported to us so we can fix them, resulting in a win-win situation for everyone. Is it a publishing option just like all the other ones in terms of ease of use? No, it will be free just like our PC and Mac Standalone publishing options. Why are you referring to it as “Linux” standalone desktop publishing? Because Linux (as an operating system) runs inside of all sorts of devices, but this export option is specifically for 32 and 64-bit end-user desktop systems. What hardware/software configurations will be supported? While games exported from Unity will run on most modern Linux desktops, we will (at this time) only be offering official support for Ubuntu 10.04 or later, with a graphics card that has vendor-made drivers installed. San Francisco – June 18, 2012 – Unity Technologies, provider of the Unity multi-platform engine and development tools, is excited to announce Unity 4, the next generation of the Unity development platform. The launch of Unity 4 demonstrates the platform’s AAA push that levels the playing field between the largest and the smallest studios, enabling anyone from the most indie game designer to the biggest multinational AAA studios to develop amazing groundbreaking games, and effortlessly deploy to multiple platforms. Customers who pre-order Unity 4 will be offered early access to the Unity 4 beta. Mecanim, Unity’s powerful and innovative animation technology, brings your characters to life in a few mouse clicks with incredibly fluid and natural motion. Mecanim combines a slick interface with powerful tools for creatingstate machines, blend trees, IK rigging, and auto retargeting of animations all inside of the Unity editor. An impressive array of retargetable animation will be available in the Unity Asset Store. Developers will have access to a wide range of options that will help bring their characters to life with fluidity and grace. Unity 4 fully supports Microsoft’s DirectX 11. This offers developers the ability to take advantage of the GPU in new and exciting ways: increased shader capabilities with shader model 5, tessellation for smoother models and environments in game worlds, and compute shaders for advanced GPU computation. Mobile platforms have also received a boost in visual fidelity with optimizations and new features. Unity 4 features real-time shadows on mobile, skinned mesh instancing, the ability to use normal maps when baking lightmaps, and a refined GPU profiler. It’s easy to make extremely high-end visuals that scale across the best of what’s available on modern PCs and the most advanced mobile graphics chips. With Unity 4, developers can create a new game, or take existing Unity 3D content—for iOS, Android, desktop, or the Web — and publish it to the Adobe Flash Player, installed on more than a billion PCs worldwide. Leveraging its industry leading Editor productivity tools, Lightmap and Lightprobe baking, and Occlusion Culling tools, Unity 4 is the powerhouse development tool forcreating 3D content for the Adobe Flash Player. Unity 4 will include a preview of a new deployment option to publish games to Desktop Linux, clearing a path for the Unity community to bring exciting new content to the estimated 10% of the game-hungry PC market. 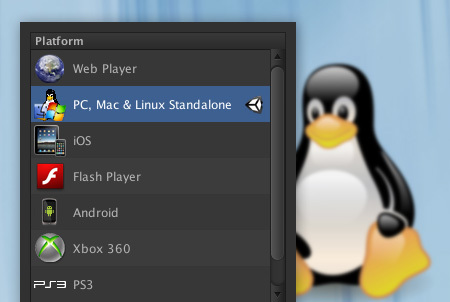 Desktop Linux standalone publishing will be available for all Unity 4 users at no additional cost. Unity 4 is available now for pre-order from the Unity store (https://store.unity3d.com/). Unity 4 will be demonstrated and discussed in further detail at the Unite 2012 developer conference that takes place August 22nd – 25th in Amsterdam. For tickets and more information about Unite, visit http://www.unity3d.com/unite/. Unity Technologies is the creator of Unity, an intuitive and flexible development platform used to make wildly creative and intelligently interactive 3D and 2D content. The “author once, deploy everywhere” capability ensures developers can publish to all of the most popular platforms. Unity Technologies boasts a thriving community of 1,000,000 registered developersincluding large publishers, indie studios, students and hobbyists. Unity Technologies aggressively re-invests in its award-winning 3D development tools and democratization initiatives, such as the Asset Store digital content marketplace and Union game distribution service, in order to remain at the forefront of innovation. Unity Technologies is headquartered in San Francisco and has offices in Canada, China, Denmark, Lithuania, Sweden, the United Kingdom, Japan and Korea. For more information, visit: http://unity3d.com. Unity and all other product names are trademarks of Unity Technologies or its subsidiaries or affiliates. Adobe and Flash are either registered trademarks or trademarks of Adobe Systems Incorporated in the United Statesand/or other countries. All other product names and trademarks belong to their respective holders. 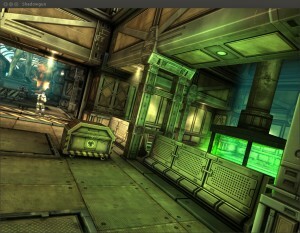 There are currently no known/announced plans to port Shadowgun to Linux — the screenshot you see was taken from a Linux export of Sadowgun’s fly-through demo, freely available on the resources section of the Unity 3D website. Unity had a Linux port in the works for some years before Unity’s relationship with inxile began (see the “Why Linux Now” section of http://unity3d.com/unity/4/faq for more details), but Unity Technologies certainly hopes to work closely with the developers behind Wasteland 2 in order to make the Linux port as good as it can be. Is this means that I would be able to run Unity on my Linux DeskTop as well?? And About Browser games based on Unity, for example BattleStar Galactica is using Unity and I cannot play it on my Linux PC because I cannot install the plug-in on Chromium, I suppose that after Unity4 be released that will eventually change. You will not be able to develop Unity games on Linux, but you will be able to create native Linux client of your game (which you can develop on Windows).